← Revamping a Writing Strategy… for Math! 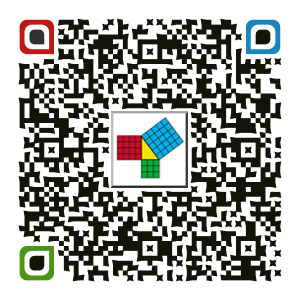 I have been using QR codes quite a bit in my math classes. I like to use them primarily as a “refresh button” strategy to get all of those brains out of the middle-of-the-lesson muck. Using QR codes refreshes brains and gets everyone engaged and curious. I can’t get enough of these goofy things, and neither can my students! By the end of this week, my pre-algebra classes will be applying the Pythagorean Theorem to problem-solving situations. For some in-class guided practice, I whipped up a quick PDF template for students to annotate, and used Unitag, my new favorite QR code generator, to help students access the PDF file. Since most of the tasks I’ve been using with QR codes are quick in-class instructional experiences, I haven’t yet delved into the world of workflow and file management – we just keep zappin’ these codes – so I am creating and accumulating a LOT of them. Thankful that Unitag allows me to place a “logo” in the QR code, so I can see what the code entails at a glance, and so can my students! Check this one out, and feel free to zap it so you can see the PDF too. This entry was posted in Algebra 1, Pre-Algebra and tagged annotate, iPad, PDF, problem solving, Pythagorean Theorem, QR code. Bookmark the permalink.